Whenever you base a movie off of a book or — worse — historic event, everyone expects the plot to be tweaked, but the real criticism comes from depicting the characters in a way that not everyone agrees with. George Clooney’s solution is simple: Keep the details but change the names to make brand-new characters. “The Monuments Men” is based off of a little-known real-life crack team of artists and curators, brought into World War II with the mission to preserve historic buildings and artifacts and great works of art as much as possible. Restorationist Frank Stokes (George Clooney) brings together a crack team: Meet curator James Granger (Matt Damon), architect Richard Campbell (Bill Murray), sculptor Walter Garfield (John Goodman) and theater guru Preston Savitz (Bob Balaban). They fly to Europe to join with Brit Donald Jeffries (Hugh Bonneville) and Jean Claude Clermont (Jean Dujardin), a Frenchman. They are further aided by an 18-year-old German-born Jew, Sam Epstein (Dimitri Leonidas) and a dowdy ex-secretary for SS officers in Paris, Claire Simone (Cate Blanchett, who does her best to be mousy). Besides documenting the damage to cathedrals and castles, the Monuments Men are also tasked with finding and retrieving art stolen, largely from churches and private Jewish collectors, by Nazis to put in Hitler’s art museum. The Monuments Men, as the team was dubbed, were already established in their careers and veered on the older side, especially when compared with the throngs much younger men who made up the bulk of the armed forces, but still fought in battles besides their restoration work. The Monuments Men were assigned all over Europe, but this movie, and a fantastic book of the same name by Robert Edsel, focus on the efforts in France, Germany and Austria. As mentioned, the characters in “The Monuments Men” are thinly veiled representations of the real deals. George Stout becomes Frank Stokes, James Roramir becomes James Gardner and so on. Roramir really did work closely with an ex-secretary for SS officers, Rose Vallard, who helped them track down stolen artwork. The team’s translator was really an 18-year-old German-born Jew, Henry Ettlinger, who immigrated just before the Nazi’s “cultural cleanse.” The manner of the deaths are fabricated, but the body count at the end is the same. And while the team was “older,” they were mostly in their 40s — a little younger than the movie suggests. These changes aside, the story does align closely with history. More than that, “Monuments Men” is fun and lighthearted, relative to the sometimes heavy subject matter. Clooney, who also co-wrote the screenplay, keeps the story engaging even without as many firefights as most war films — it’s sort of like a funky cross between “Saving Private Ryan” and “Ocean’s Eleven,” though, honestly, the action is a little lighter than either. The cast makes the most of the lightness. The performances are all virtually flawless, and the paired-up characters play well off each other, especially Murray and Balaban, and Goodman and Dujardin. The characters, too, believably seem to toe the line between artists and soldiers, even when that line becomes blurry. And the question always remains: How much sacrifice is a piece of art worth? In the movie, and in real life, the mission of the Monuments Men is criticized by soldiers and brass alike, citing the worth of lives verses the worth of art. Clooney’s character repeatedly defends the mission, arguing that a country can’t truly be saved if its culture is destroyed. 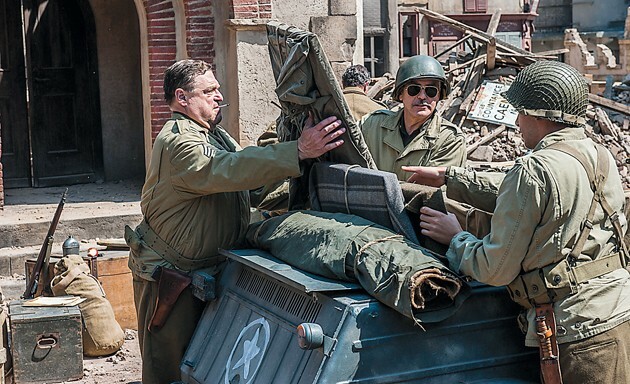 There have been some changes, but the heart of the movie remains true to the Monuments Men and exposes viewers to a chapter of history that has been all but forgotten. You should check out the book, too, but the movie is well worth your time.